Coeur d’Alene artist turns a tree into a Little Free Library. Make that Little Tree Library. UPDATED: Mon., Jan. 21, 2019, 12:22 p.m.
To see it is to feel as if you’ve been transported into a fairy tale. Stone steps lead up to a tree trunk that’s been hollowed out. Inside, three shelves are filled with books just waiting to be read. Lights illuminate the exterior and interior, giving the whole thing an even cozier feel. 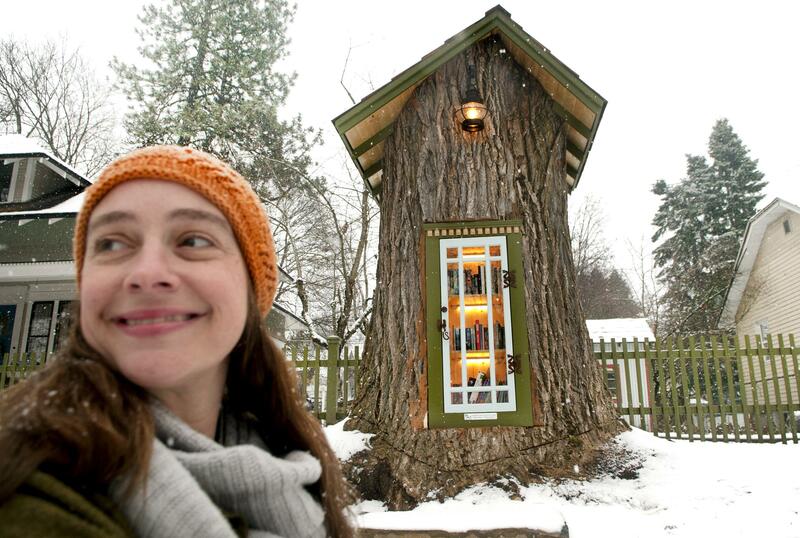 This Little Free Library, or should I say Little Tree Library, is the work of Coeur d’Alene’s Sharalee Armitage Howard, an artist, bookbinder and Coeur d’Alene Library employee. Little Free Library is a book exchange program in which readers take a book from a little library and leave a book for another reader. There are currently more than 75,000 registered library boxes in 90 countries. Armitage Howard made a Little Free Library several years ago for an auction, then bid on it herself because she was sad to see it go. Armitage Howard inadvertently got her wish when she and her husband realized the 110-year-old tree in their front yard was past its prime. They didn’t want to cut it down, but its core was rotting, and it had been dropping branches for years. But once Armitage Howard realized the tree would be the perfect location for a little library, she found a company to cut it down and contour the trunk to match her vision. Cold weather dictated that she build and paint the library in her home. Her husband helped with the roof, and a neighbor helped with the electrical components. About a month after the project began, Armitage Howard fitted the bookshelf insert into the tree. “Once I start a project, I usually hit it pretty hard,” she said with a laugh. On Dec. 10, the project wasn’t quite finished, but Armitage Howard decided to share a photo of her library on Facebook anyway. She wasn’t expecting more than a few comments from friends, but the photo was shared nearly 103,000 times and netted more than 13,600 comments. Armitage Howard’s Little Free Library has since been mentioned on dozens of websites, including Oprah magazine, House Beautiful and Southern Living, and international news outlets. Rock icon David Crosby even tweeted (and Nora Dunn retweeted) about it. Since the photo has gone viral, Armitage Howard said hundreds of people have stopped by the library, which is full of books for readers of all ages and in a variety of genres. Armitage Howard admits they could have cut down the tree and built a more standard Little Free Library, but she’s happy she could preserve part of the tree. Armitage Howard’s library is registered with the Little Free Library organization and can be found on the organization’s world map by searching for charter number 82068. She’s proud that her library can help fulfill the need for access to books outside of library and bookstore hours and that her library has the potential to brighten a visitor’s day and encourage them to pick up a new book. Published: Jan. 20, 2019, midnight Updated: Jan. 21, 2019, 12:22 p.m.